It's looking increasingly likely that Bill Shorten will become Australia's next PM. That's hardly a frightening prospect, writes Richard Tuffin. I remember fairly vividly a report the ABC ran one Sunday morning many years ago about an up and coming Labor star by the name of Bill Shorten. This was some time ago, before Mr Shorten’s well-documented efforts supporting the trapped miners in Beaconsfield and well before he entered Parliament. The report mentioned prophetically how the powers that be within the Labor Party back then recognised Shorten’s potential as a future Party Leader and prime ministerial prospect. The exact qualities Shorten held that defined that potential were, just as they are now, a little hard to isolate. Even Shorten's staunchest supporters would probably acknowledge, if only privately, that he's no Bob Hawke when it comes to charisma and he’s certainly no Paul Keating when it comes to political wit and quips. One episode of Mad as Hell will confirm all of that if you’ve any doubt. But love him or loathe him, Australia needs to seriously start coming to terms with the fact that there’s every chance now Bill Shorten will be the next Australian Prime Minister. Bill Shorten meeting Bob Hawke for the first time. It’s an obvious thing to say, but I reckon we’ve been so distracted by the day-to-day political issues, or more aptly, the complete dysfunction of the current omnishambles Government that we’ve yet to seriously consider what a Bill Shorten prime ministership would look like. It’s well past time that we did that. If he wins, I reckon Bill Shorten will be a rather unique prime minister by Australian standards. He'll be as far away from being another Gough Whitlam or Keating as he will be from being another John Howard or Tony Abbott. I don’t think this will hinder his potential to be a great prime minister, especially if he performs his duties differently to the adversarial way Tony Abbott did. Firstly, you have to give Shorten credit for leading Labor out of the quagmire of instability that existed after the Rudd/Gillard/ Rudd years. Even Labor’s staunchest opponents surely have to admit that Labor now presents itself, at least publicly, as a strongly unified Federal political Party. Fair effort really. Obviously, this stability will present as an attractive option to an electorate completely over governing political parties squabbling over their own internal conflicts rather than actually running the country. Shorten would also be the sort of leader to make a real effort to reach across the political divide for the good of the country. Wouldn’t that be novel! Sure he’ll have his own agenda, both political and personal, but if the Coalition decide it’s time to take stock of themselves and maybe attempt to be a little more moderate in their policy approach, we may see Shorten genuinely attempt to reach across the political divide in an effort to tangibly improve the average lot for all Australians. Not just for the ones who voted for him. That’s just got to be a good thing, especially given the entirely selfish way the current Government has tried to push its own purely partisan agendas upon us. For all of these strengths though – and like all new to the highest office in the land – it’s fair to assume it will take Shorten some time to grow into the role of prime minister. Given the political landscape of the last decade, I don’t think it’s time Australian voters will afford him generously. Both his fans and foes will be quick to judge Shorten. The weight of expectation on him and the Labor Party as a whole to quickly repair the damage of the Abbott/Turnbull/Morrison era will be immense. People will want positive change — and they’ll want it quickly. Shorten will also face the challenges of leading an Australian society whose social attitudes are changing at a breathtaking pace and whose interest in, and awareness of, politics and social issues is broadening just as rapidly. I reckon this sort of assumed pressure will weigh heavily upon Shorten as he battles to repair the damage of half a decade of overtly conservative, neoliberal government. But there are strong factors that will benefit Shorten in all he’ll have to do if elected. Bill Shorten has, through a mixture of good luck and real design, got a very strong and diverse team of capable and experienced parliamentarians behind him. They'll be able to help him on his new quest should the predicted change of Government come to pass. In terms of experience, Shorten will have at his disposal the likes of Penny Wong, Tanya Plibersek, Anthony Albanese, Tony Burke — the list goes on. They’ll be there to help support and guide him along the way. They should also inspire Australians that the forecast change of government will result in an unprecedented era of rapid positive growth and cultural change for this country. But add to this list up and coming stars the likes of Terri Butler, Linda Burney, Katy Gallagher (hopefully) and Ged Kearney who are all extremely capable of assisting Shorten lead – rather than just govern – Australia. This makes the prospect of a new Labor government next year becomes a truly tantalising prospect. If only my beloved Carlton Football Club had the equivalent football talent waiting in the wings, I might be booking Melbourne accommodation for the later weeks in September next year as we speak. The timing could hardly be more perfect for a strong Labor government to lead the country. They must, however, remain true to their Party values, but also be flexible enough to evolve to the needs and wants of an ever-changing society. One cannot exist without the other. 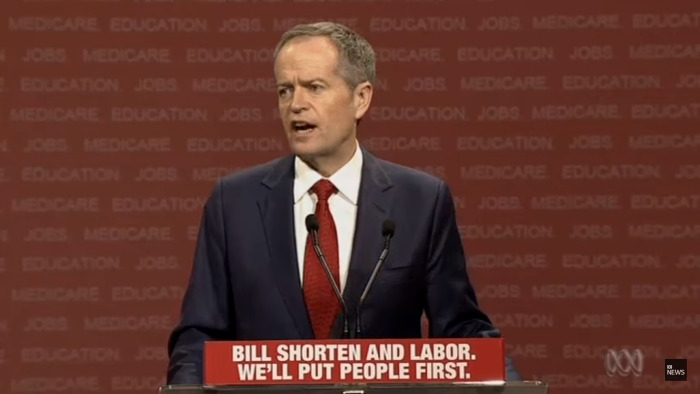 I, for one, am extremely excited at this prospect of a new Labor government — even one led by Bill Shorten. Labor’s continued strong standing in the polls, along with Shorten’s improving personal standing, confirms I’m far from being the only person who feels this way. What I think we need to do as constituents now is help pave the way for Shorten and a new Labor government. If we start now readying our minds towards this likely outcome, we can help speed Australia forward to a new level of success. I can hardly wait for all of this to unfold, to be honest. If only it could all start happening this Saturday. Richard Tuffin is a Canberra based photographer and blogger. You can follow Richard on Twitter @RichardTuffin.